March | 2010 | Let Teddy Win! 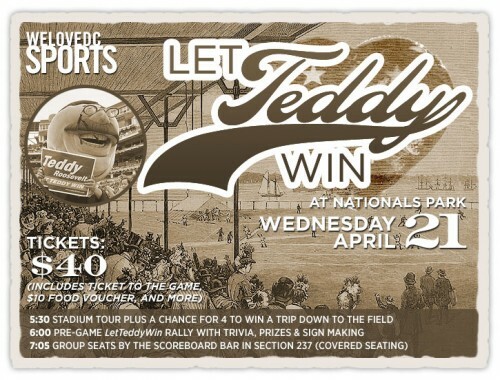 Baseball is in the air, and the WeLoveDC blog and the Nationals are kicking off the season by sponsoring a special event for fans of the Nats, the racing presidents, and of course, Teddy Roosevelt. On Wednesday, April 21, with the Rockies in town for the Nats’ first extended homestand, we’ll be going behind the scenes for a private tour and pre-game rally, plus prizes, sign-making, and an opportunity to go down on the field before the game. WeLoveDC has packaged all this into a $40 ticket, which also includes entrance to the game, a $10 food voucher, and a seat amid the Teddy Roosevelt cheering section in section 237 by the scoreboard bar. 5:30 p.m. Tour of the stadium. We’ll go behind the scenes, tour the press box, and four lucky raffle winners will get to go down to field level. 6:00 p.m. Pre-game rally, with sign-making materials, prizes, and Nats trivia. Tickets went on sale today at eventbrite and will sell out, so order yours now. This year, the Ringling Brothers upped the ante by adding your favorite racing presidents to the spectacle. 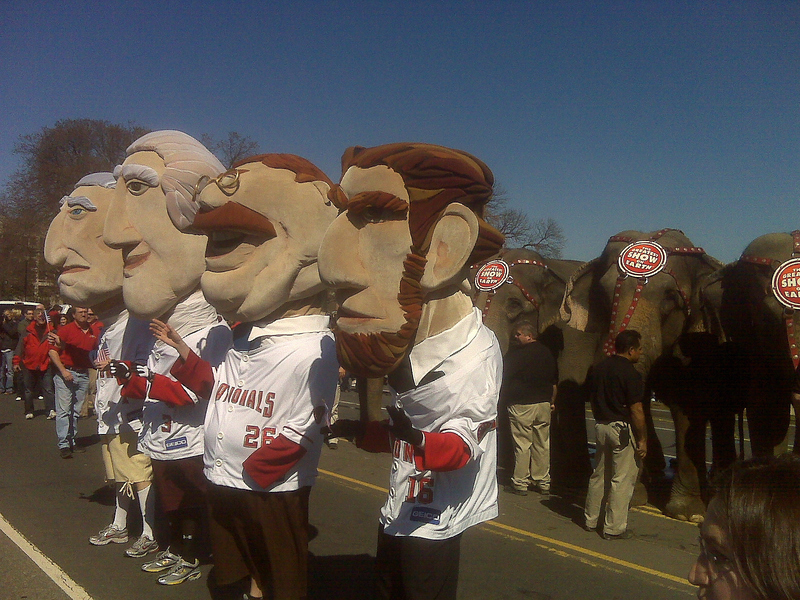 For the first time, Abe Lincoln, George Washington, Thomas Jefferson, and Teddy Roosevelt took part in this right of spring, arriving via bicycle taxi and escorting the famous Elephants on their walk, from DC’s Garfield Park all the way to the Verizon Center, where the circus begins tonight. 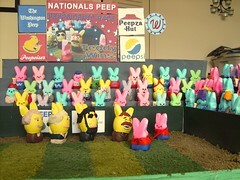 Photos courtesy of the Washington Nationals. Rock legends The Eagles will headline a concert at Nationals Park on June 15. 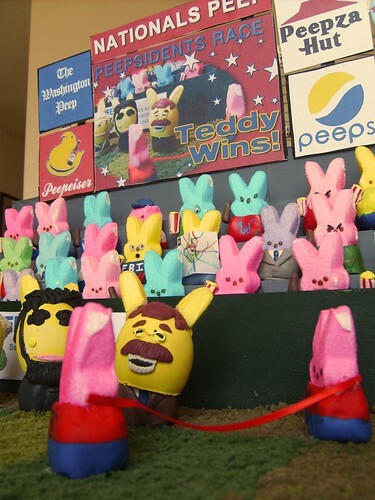 They’ll be joined in the Nationals Park outfield by country stars The Dixie Chicks and Keith Urban. The Washington Nationals announced the concert today. Tickets and parking will go on sale to the general public on Monday, March 29 through tickets.com. American Express cardmembers will have early access to tickets beginning Monday, March 22 at 10:00am. VIP ticket packages are also available from iloveallaccess.com. This will be the 2nd concert in Nationals Park history, following last year’s successful Billy Joel and Elton John concert. A concert featuring Dave Matthews Band will follow on July 23. ESPN Radio’s Doug Gottlieb is running “Mascot Madness,” in which fan voting will determine America’s #1 sports mascots for 2010. Gottlieb hand-picked 64 mascots for the fan tournament, and — sorry Screech — the Washington Nationals racing presidents were selected as the only representative of DC-area professional sports teams. The Rushmore presidents are seeded at #7 and currently behind in a very tough divisional matchup vs. their hated rivals, the racing sausages from Milwaukee. Presidents fans should VOTE EARLY AND OFTEN at espn.go.com. If the presidents beat the sausages in this round, they face a likely match-up with the Orioles mascot, The Bird. With Steven Strasburg making his second spring training start in sunny Florida, the local Nats fans facing another weekend of lousy DC weather were greeted to their own surprise treat today. Yes, the crowd that braved the rain this afternoon to line Constitution Avenue for the 2010 Nation’s St. Patrick’s Day Parade was treated to an appearance by some very special dignitaries. Emerging from between the floats, marching bands, and pipe bands were the Nationals’ very own racing presidents George Washington, Abe Lincoln, and Teddy Roosevelt, who accompanied the DC Fire Department through the parade, riding atop a hook & ladder truck and walking along Constitution Avenue to greet and shake hands with the fans who lined the parade route. More photos at the NatMobile Facebook page.